The lowdown: Soju is serious business in South Korea, as many of the post-soju blackout pictures floating around the internet can attest. It’s not hard to see why there’s a big drinking culture there when you consider the pleasures of a few glasses—or bottles—of soju in combination with good company and, most importantly, a delicious meal. Soju’s uncomplicated nature provides an ideal counterpart to Korean food, whether it’s to tone down a fiery mouthful of tteokbokki (a spicy rice cake) or balance the fatty, savory juiciness of samgyeopsal (grilled pork belly). Soju and Korean food have such a symbiotic relationship that it might come as a surprise to discover that soju has foreign roots, only appearing in Korean culture in the 13th century when Mongol invaders brought arak’s distillation methods to the city of Andong, in what was then Goryeo. Traditional soju is still produced in Andong and other cities to this day using a blend of fermented and distilled rice and grains. However, the modern soju that’s commonly available in Korea and overseas is often made from diluted ethanol produced from sweet potatoes. This stems from a 1965 government ban on using rice to brew soju due to a rice shortage. The ban has since been lifted, but many popular and cheap brands still use the dilution process. Jinro-brand soju has topped the list of the most-sold liquors in the world for several years, which speaks to the frequency with which Koreans consume the beverage, and the amount of it they drink. 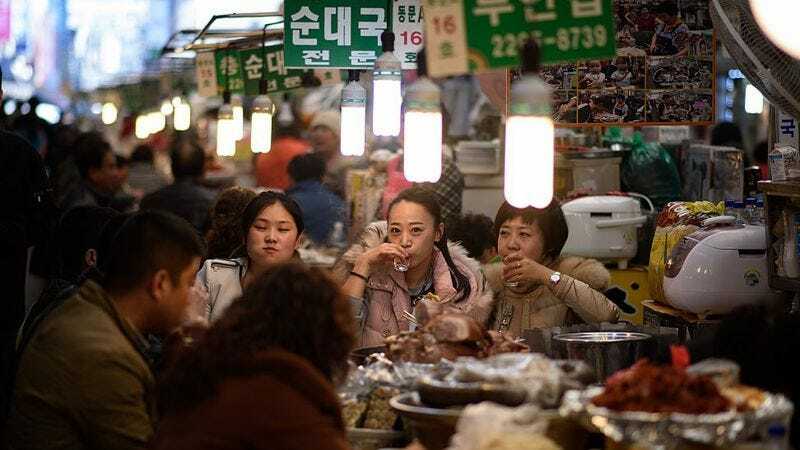 Most Koreans will say that soju goes best with samgyeopsal and kimchi-based stews like budaejjigae (made with instant noodles and cured meats), though they will eventually concede they drink soju with everything and often enjoy it on its own. When in Korean company, there are strict social rules for drinking soju. The basics are that it’s usually served cold in small traditional glasses—you never drink from the bottle—and you must always use both hands when pouring or receiving a glass. You never pour for yourself, though you may pour for others whenever you see an empty glass. There’s also an entire ritual around opening a bottle of soju. You shake the bottle before opening or, if you’re feeling fancy, swirl the contents to create a small whirlpool inside the bottle. While some people just open the bottle at this point, others like to show off a few more moves by slapping the bottom of the bottle with a palm or an elbow before twisting off the cap and sharply poking the neck of the bottle with the webbing between the index and middle fingers so that a small amount of the soju spills out. A Korean friend explained that this process supposedly comes from the days of traditional soju production, which often left sediment inside bottles. The swirling and slapping is meant to drive the sediment to the top so that it can be knocked out of the bottle. Although production methods now filter away any sediment, the practice has remained and is fun to watch, particularly if the person opening the bottle is already drunk. The first shot of soju is usually downed in one go, but it’s acceptable to sip afterwards. However, soju’s relatively low alcoholic content, with most commercial brands’ alcohol by volume (ABV) hovering at around 20 percent, means that Koreans will usually put it away a shot at a time. Koreans also drink soju in mixed drinks like somaek, where a shot of soju is dropped in a glass of beer, or cocktails such as watermelon soju, a trend from a few years ago that helped kickstart a wave of fruit-flavored soju. The taste: Much has been said about soju’s gasoline-like harshness, and low-end soju can certainly taste rough, with very little depth. Cheap soju is clearly meant to get you drunk in the shortest amount of time by mixing just enough sweetness to make the ethanol more drinkable. While most mid-range brands have a clean, mild taste rounded out with sweeteners and flavorings, commercial soju doesn’t provide a particularly complex taste experience. For example, it doesn’t have the subtle umami flavor of sake, which people either like or find off-putting. Commercial soju is meant to be palatable to the largest number of people possible; it does not shilly-shally around with delicate flavors and aftertastes, focusing instead on an identifiable main flavor usually measured in sweetness level. As a result, mid-range soju has an innocuous quality that allows it to go down effortlessly, unfortunately making it too easy to lose track of how much you’ve imbibed until it’s too late. Fruit-flavored soju tends to be lower in alcoholic content but higher in sugar, as it is usually marketed to a younger crowd; it’s even available in juice-box form. Premium soju made through traditional methods has a much higher ABV, sometimes reaching up to over 50 percent, but is considerably smoother, with different brands boasting their own distinctive tastes and fragrances, which range from floral to fruity. Traditionally distilled Andong soju is still renowned for its quality and complex flavor, though the brands that come from the city are generally perceived as old-fashioned in Korea. Possible gateway: It’s inevitable that you’ll run across one of beverage company HiteJinro’s many varieties of soju, especially Chamisul, which is Korea’s best-selling brand. Chamisul is exactly what you’d expect of a mainstream soju, with its genial quality and rubbing alcohol notes. As an alternative, Busan’s most popular soju, C1 Blue, is lighter and smoother, with a cleaner finish. Chum-Churum (which means “like the first time”) is a popular, youth-oriented soju with a lower ABV and moderately sweet flavor that isn’t as cloying as a fruit-flavored soju. Although these three give you a pretty good idea of the types of commercial soju that Koreans drink, you might want to skip them and go straight for a premium brand like Hwayo. Made by a company that also specializes in fine pottery, Hwayo has positioned itself as a neo-traditional soju produced with traditional distillation methods then aged in kimchi pots. Hwayo soju is truly lovely and smooth, with a subtle but distinct rice fragrance that is reminiscent of Asian rice-based desserts. Next steps: As most traditional soju continues to be made with the same artisanal methods that have been used for generations, it’s a great chance to experience a bit of history through your taste buds (and later, through your hangover). A good place to start your soju graduate course is Moonbaesool, whose origins date back to over 150 years. Known particularly for its 40-proof version, Moonbaesool’s name comes from “moonbae,” which means wild pear. There is a velvety pear flavor that appears when you first taste Moonbaesool, quickly followed by a gentle rush of heat. It’s definitely a drink to savor, much like a good whiskey. Talk like an expert: When it comes to soju, you only need to learn two words: “Gunbae!” (“Cheers!”) and “Jjan!” (the onomatopoeic sound of glasses hitting each other). Could drinking non-alcoholic beer make me a better runner?